The barnstormers were entrepreneurs in the truest sense. They wanted to fly and they wanted to find work as pilots. There were few opportunities for pilots in the early 1920s, so they made their own. They knew that to make a living, they had to get the customers. They went town to town and convinced people to come out to the fields and watch them perform. They distinguished themselves from their competitors (other pilots) by pushing the envelope, performing daring stunts, taxing their airplanes, and creating stunts that thrilled, amazed, and left the crowds wanting more. You may not be performing loops or barrel rolls, but as an entrepreneur and small business owner, you probably find yourself in the same situation: looking to grow your business. You can’t simply put up a sign or a website and expect people to find you. You must be willing to go outside of your comfort zone by taking your talents and skills to the people and convincing them of your abilities. With the internet and social media, you are no longer required to go town to town stumping for customers, but it’s essential that you find ways to differentiate yourself so that you stand out above your competitors and draw the customers to you. 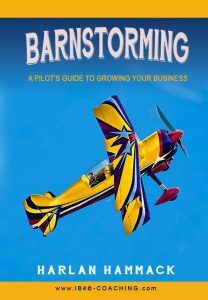 In his second book, Harlan Hammack continues the analogy of flight and presents the inspiring stories of the early barnstormers to encourage entrepreneurs to grow their businesses by networking with other professionals, by getting their message out to their intended audience, and discovering ways to set themselves apart from their competition.